Tom Wallisch's Mom buys all of his promodel gear from his sponsors to show her support haha. Background: I work at evo. 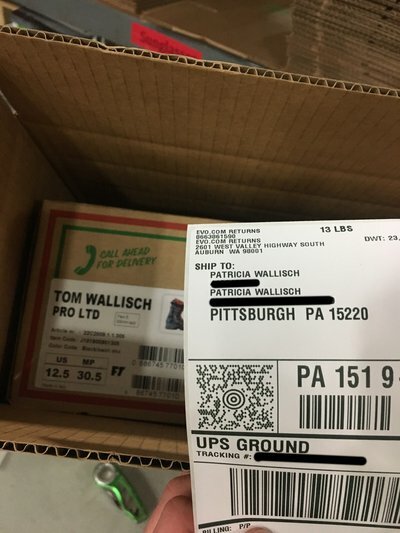 I was down at our warehouse helping ship out orders last night and came across this package of Tom Wallisch Pro Fulltilts addressed to his mom. He said his dad buys his pro model gear too. Imagine two old geezers out skiing groomers with the old Tom Wallisch pros that looked like jordans. bruh, you just ruined tammy's christmas surprise! nice goin, ya grinch. Common Line/FT... Start flowing Momma Pretz some product. I love it. If I was a TWall level pro and I tried to gift pro model gear to my family on Christmas, they would re gift it back for my birthday two weeks later. I hope they have his sweet protection ski jacket too, that one was one of my favorite coats ever. PB1 He said his dad buys his pro model gear too. In his recent podcast with Mike Powell, he said his parents refuse to get free gear or pro deals and prefer to buy his pro models at full price. I'm pretty sure my parents would buy my pro-model. Parents are stoked AF! Awesome!!!! If I ever see an older guy rocking some fresh TWall boots at springs, I’ll know who it is haha.